Fall meals sound dreamy. Who doesn’t love that inherently cozy autumnal vibe that only a butternut squash risotto or a chocolate chip pumpkin loaf can give? It makes me want to pull up my tall wooly socks and don my adorable but sort of itchy cardigan right into the nearest apple orchard. But that wasn’t my reality last week when I was looking into the fridge trying to figure out what to make for dinner. I did find 4 tiny white sweet potatoes in my fridge – they were long and thin and looked like the perfect thing to roast. So I scrubbed them well, poked them with a fork and popped them into a hot oven. 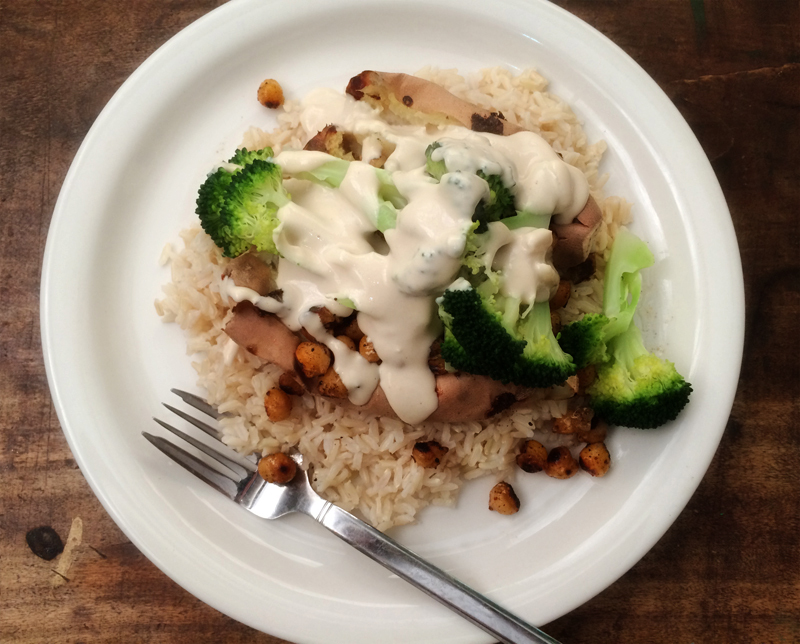 I wasn’t sure what would come next, but pulled out some broccoli, a can of chickpeas and some rice. It was a good start. I got the rice going quick because brown basmati rice isn’t the speediest rice on the block. Next, I spiced up the chickpeas with cumin and chili and banged that up in the oven too. The real genius move was making a simple tahini sauce which I knew would pair well with the chickpeas and the sweet potato (I was inspired by this butternut squash and lentil salad from ages ago). Garlicky, lemony, saucy perfection! The resulting dish was incredible. I’m not kidding – this is the kind of meal that I’ll gladly eat on a weekly basis during the fall and winter months. I’m now thinking all kinds of possibilities, like sprinkling it with zaatar and serving this over red quinoa instead of rice. 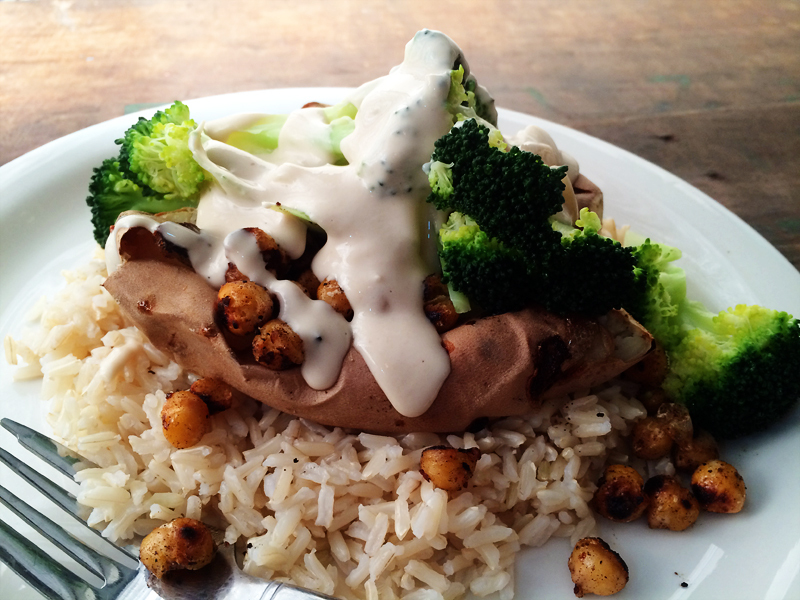 Or filling up half an acorn squash with a rice/broccoli/chickpea mix and drizzling with that sauce. Plenty of options to carry you through these dark and rainy nights. You can use any kind of sweet potato you like, from rusty orange yams to the creamy off-white versions. I went with the white-ish version here and ate the skins too (extra vitamins and bonus texture!). I chose to serve this meal with rice but you can add any grain or choose to just skip it altogether. The leftovers were delicious too. Wash and scrub sweet potatoes and pierce all over with a fork. Place in oven directly on the oven rack and let bake for 30-45 minutes or until tender. A rule of thumb, roasted sweet potatoes can never be too tender (but they can burn, so watch carefully). Also, sweet potatoes tend to seep molten sugar while baking, so line the bottom of your oven with foil or be prepared to do a little clean up afterwards. Toss the chickpeas with the oil, cumin, chili powder and aleppo pepper and a little kosher salt. Roast chickpeas on a cookie sheet for about 25 minutes or until toasted and golden, shaking your pan halfway through to prevent any scorching. In a small bowl, combine tahini, yogurt, lemon juice, garlic and salt together, whisking well. I usually add in a spoonful of water or 3 to get the right thickness – drippy but not thin. Steam broccoli until bright green & tender-crisp – a few minutes. Drain. To serve, place a sweet potato on a plate, and slice down the middle. Top with the broccoli and chickpeas and drizzle heavily with the tahini sauce. Splash with hot sauce, if desired. What a great idea using the sweet potato as a vehicle for other add-ins. I love sweet potatoes but always chop them into fries and bake them. Time to change it up a bit. You know I’ve never tried roasting chickpeas in the oven, yet I’ve “pinned” several recipes showing them prepared like that. 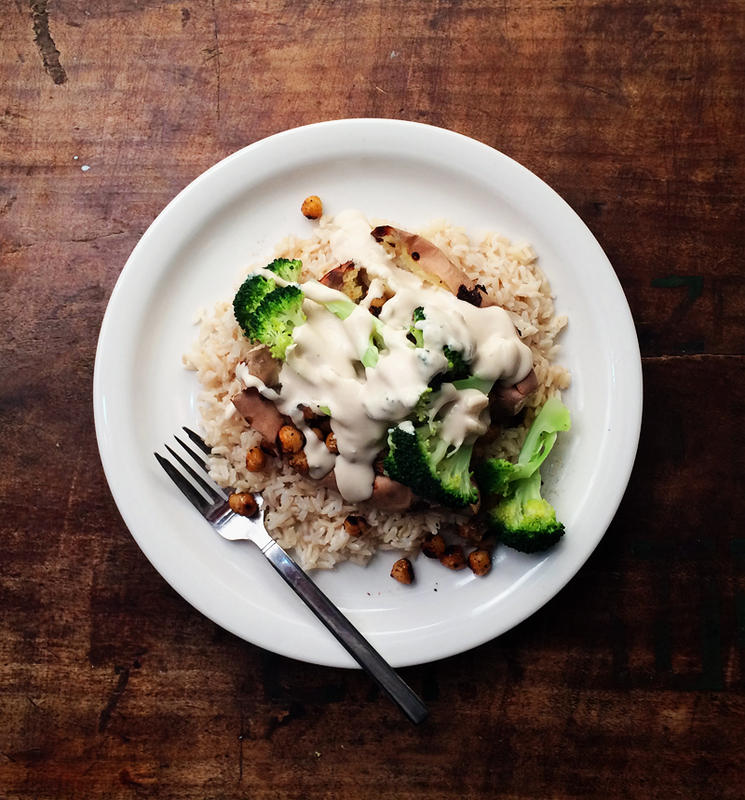 Oh and tahini, you can never go wrong with that as a base for a dressing. I found some black tahini at the health food store which I’m eager to bake with….tahini cookies or maybe a tahini cake…yum! Ok, pull out your wooly socks because “butternut squash risotto” is actually my blog post for today. But I love these sweet potatoes too! Have you ever tried roasting broccoli? Cut into florets, and peel and cut up the stem into sticks too. Toss with a little olive oil, salt and pepper and toss in the oven at 400 or 425 until tender. SO good!! Parmesan on top is fantastic too! Fall meals are definitely the best! 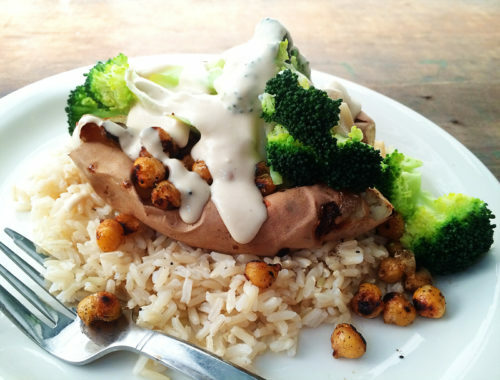 I haven’t had a stuffed baked potato (sweet or otherwise) in so long This sounds like it would really hit the spot on a grey and rainy day! Maikki, Oooh, I like the harissa paste addition! Yum. Eileen, it’s perfect for rainy grey days 🙂 Enjoy!